Unlike Page One, this page is laid out by value rather than issue date. Our purpose here is to look at the design and subject of each stamp. The first group of six stamps showing three native butterflies and three native moths. They are all the same small vertical format, in each case showing a topside, opened wing view. The designs use a strong background colour to achieve what is actually quite a striking appearance. ½c - Glade Copper Butterfly. 1c - Red Admiral Butterfly. Issued 2 September 1970. This native insect is common in wasteland and open areas throughout the country, particularly during the late summer. The larva which often hibernates in winter, feeds on muehlenbeckia vine. Issued 2 September 1970. Found during summer, this striking insect, which has the Maori name kahukura, is not often caught without a net as it is a powerful flyer. During the immature stages of its development the butterfly lives in the stinging nettle plant. 2c - Tussock Butterfly. 2½c - Magpie Moth. (Three varieties exist: Argyrophenga antipodum, A. harrisi and A. janitae). Issued 2 September 1970. The female variety of this butterfly has a paler colouring than the male and both are found only in the tussock country of the South Island. Issued 2 September 1970. One of the few day-flying moths of New Zealand, this species is often mistaken for a butterfly. Its sharply contrasted colours warn birds of its apparent unpleasant taste. As a grub it feeds on Cineraria and related plants. 3c - Lichen Moth. 4c - Puriri Moth. (North island variety: Declana atronivea, South island variety: Declana egregia). Issued 2 September 1970. As a larva this moth feeds on foliage of the five-finger tree. It is found in bush areas of the South Island but a similar species is found in the North. Issued 2 September 1970. Confined to the North Island, the larva of this insect feeds on the wood of wineberry, manuka, kamahi, puriri and several other trees. Females sometimes have a 15cm wingspan. Out of all these butterflies and moths the Puriri Moth is the only one that I have really noticed. It is attracted to bright lights and sit on the walls when I turn the flood lights on over my deck. If I leave the lights on for a while sometimes there up to 20 or 30 big moths there. Many catalogues group these next five stamps as fish. That seems to fit Ok but I'm just not sure about calling a seahorse a fish so to be safe I've called them Undersea Creatures. 5c - Scarlet Parrot Fish. 6c - Seahorses. Scarlet Parrot Fish (Pseudolabrus coccineus). Issued 4 November 1970. Abundant south of the Bay of Plenty this fish feeds on a wide variety of marine animals. Its original name 'soldierfish' was given to it by Captain Cook during his exploration of New Zealand. Issued 4 November 1970. Seahorses, yes look closely, there are two of them. Seahorses are found in various forms around the world in warmer water. They grows to about 12.5cm in length and are often found among seaweeds, which they use as camouflage. 7c - Leather Jacket. 7½c - Garfish. Issued 4 November 1970. Found in all coastal areas about rock and weed, this fish is easily recognised by its shape and the single spine above the eye. Its food is any small animals, many being removed from rock by means of it's sharp teeth. Issued 4 November 1970. Sometimes known as piper, this fish is found in all coastal areas often near the surface. It is common in shallow bays where seagrass occurs. It feeds on a variety of small animals and some seaweeds. It is easily recognised by its very long beak-like lower jaw. Issued 4 November 1970. The dark spots on the sides are said in Europe to represent the finger marks of St Peter. John Dory is largely confined to North Island waters. The colour and shape are distinctive. This stamp suffered some amazing printing errors. They can be seen in our next post, Part Three of this series. 10c - Arms & Queen Elizabeth II. 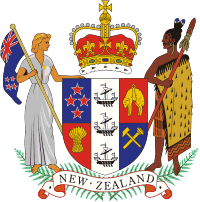 New Zealand Coat of Arms with a silhouette of Queen Elizabeth II. 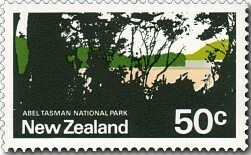 The stamp was released at this time to coincide with a Royal Visit to New Zealand of Her Majesty Queen Elizabeth II. It is rather interesting that they chose to use two extra colours (red & dark blue), for only the ribbons at the back of the Queen's head. I would have thought this would have caused a lot of extra expense for such a high use definitive. See more on the Arms design at Arms Postal Fiscals - Part One. New Zealand Coat of Arms. The Arms reflects the partnership between Maori and European in New Zealand. After the NZ Coat of Arms stamp come these three stamps with a Maori theme. I've never liked the 15c Fish Hook as its rather hard to work out what it actually is. But that 20c stamp with the Moku (Maori Tattoo) is a very distinctive design. 15c - Fish Hook. 18c - Maori War Club. The Maori used one-piece hooks of bone and two-piece hooks of wood with barbs of bone or dog's teeth. Hooks were used on lines, line and pole or for trolling. Maori fish hooks (hei matau) were the subject of the 2011 Matariki issue. I think this stamp would have worked better if it had been done in a similar way as the 18c design with one simple example of a fish hook against a blank background. The Maori club featured on the stamp is of the ceremonial type dating from 1860. Such clubs were carved from greenstone, bone, or stone and used as a weapon in hand to hand fighting. 20c - Maori Moku - Tattoo. Every Maori man and woman of rank was tattooed. Pigments were made from soot and the whole process was an extremely painful one carried out over a long period of time. One of the wineries near here used a Moku on their wine labels. They also got a giant Moku painted on the side of one of their buildings. It took nearly a week for one man to paint it but it looks amazing. This next group is often known as the National Parks, as I have labeled them above but actually the Hauraki Gulf Maritime Park is not a National Park. 23c - Egmont National Park. 25c - Hauraki Gulf Maritime Park. 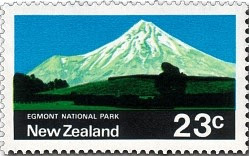 Mount Egmont / Taranaki, the dominant feature of the 79,000 acre National Park and one of the world's most symmetrical mountains, is the main feature of the stamp. It is strange how this mountain stands off by itself on the west coast. The Maoris have a story that Mount Taranaki (Mt Egmont) tried to take Mt Ruapehu's wife the lovely Mt Ngauruhoe. She loved the handsome Taranaki too. Ruapehu became so jealous and angry that he sent Taranaki far away to the West where he stands until today gazing longingly back at the lovely Ngauruhoe whom he can never have. The park embraces the seaward approaches to Auckland's Waitemata Harbour and is bounded by the Coromandel Peninsula, Great Barrier Island, Little Barrier Island and Whangaparaoa Peninsula. It is renowned for fishing, sheltered waters, and the many islands which make the area ideal for safe boating. With a playground like the Hauraki Gulf nearby, Auckland is known for having more private boats per head of population than any other city in the world. 30c - Mt Cook National Park. 50c - Abel Tasman National Park. One third of this park in the south west of the South Island consists of permanent snow and glacier ice. It also contains the highest mountain in New Zealand from which the park gets its name, Mount Cook (Aoraki). The park on the shores of Tasman Bay in the north west corner of the South Island. The park contains coastal and elevated bush-clad country. The design depicts a typical view seawards from the park. This stamp is famous for the headlands and even the ocean that went missing. See Part Four for more on this. $1 - Geothermal Power. $2 - Agricultural Technology. 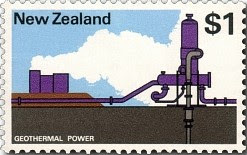 Geothermal Power - Issued 14 April 1971. Geothermal power has for many years been used for electricity generation. New Zealand sits astride the boundary zone between two of the twelve great plates which comprise the surface of the planet earth. Considerable geothermal activity is produced as a result of the meeting of the Pacific Plate and the Indo-Australia Plate. Steam finds its way to the surface in several areas but particularly in the vicinity of Rotorua. The machinery in this image is the head of a steam well. The steam comes out under high pressure and is spun in that vertical flash cylinder so the dry steam is separated from the wet steam. The wet steam and hot water is released as can be seen in the background left while the dry steam is sent to the power station via the pipe on the right. 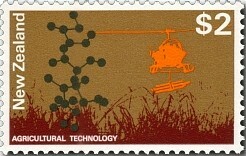 Agriculture Technology - Issued 14 April 1971. Agricultural technology is of vital importance to New Zealand, and scientific developments are given a high degree of priority. The molecular structure on this stamp represents a portion of deoxyribonucleic acid (DNA). Stamps of half cent denominations were withdrawn in 1971 and the same year, the inland postage rate for first class mail was raised from three to four cents. This produced increased demand for the four cent stamp, while large stocks of 2½ cent stamps remained (previously the rate for second class mail was 2½ cents and this had increased to 3 cents). Many sheets of the stamps both imperforated and perforated were sitting at the printer in England, while others sat in Post Offices around the country. Back to Part One. Forward to Part Three. Some information for this post came from. 1991 - 1993 Scenic Stamps.